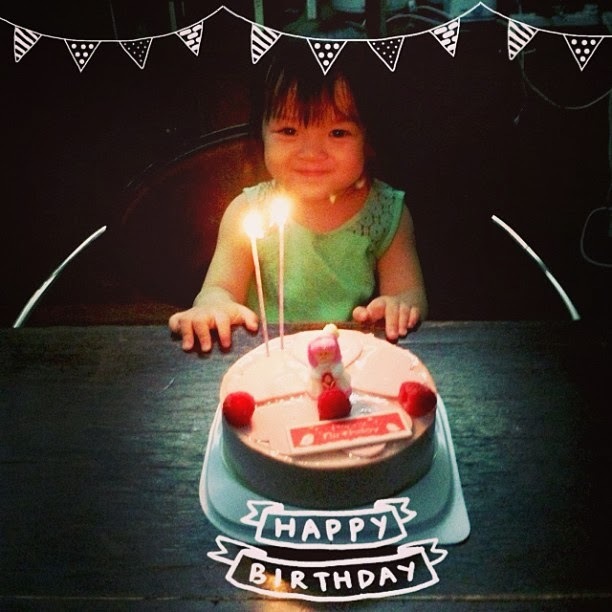 Hello Little Sunshine - Singapore Parenting and Lifestyle Blog: Kaitlin's 2nd Birthday - Actual Day! Kaitlin's 2nd Birthday - Actual Day! Finally blogging about K's second birthday!! I've decided to break her birthday celebration up into three posts..cos she had three different celebrations and I'll be starting it off with her actual day birthday, followed by the picnic party we had with her godparents and finally her school celebration! Lots had to be done as usual..and well to be honest, it was all last minute. Yes, I'm a mother now..but I'm still always procrastinating. Seriously bad habit of mine which needs to be changed..but well..a little pressure always makes me work better. Daddy Li couldn't be home for K's actual day birthday so I mostly celebrated it with her. First up was her birthday breakfast! 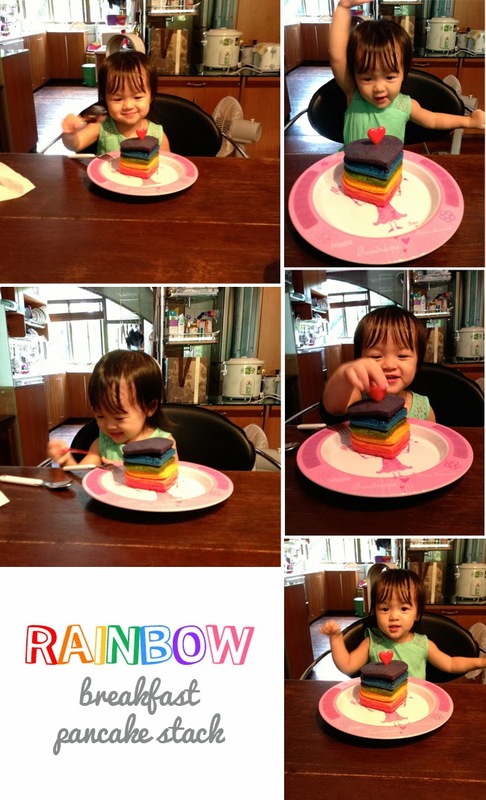 Made her rainbow pancakes which took a whole hour to make. It's really not that difficult to make. It's just the cooking that took quite a long time. 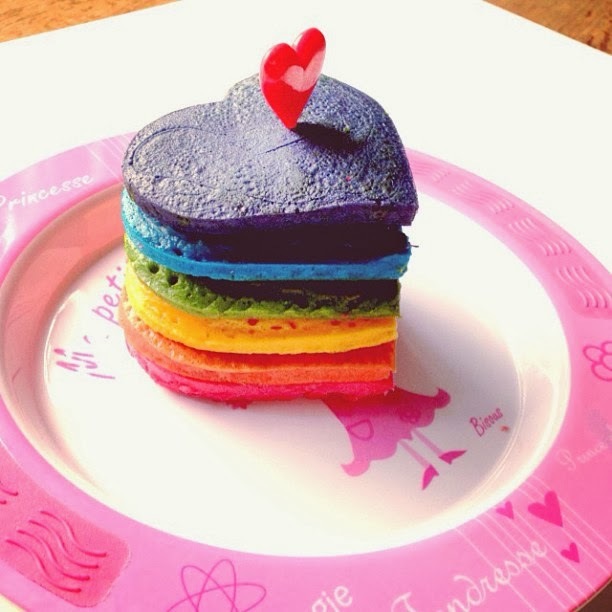 If you are wondering how to go about doing rainbow pancakes, it's real easy. Use your usual pancake recipe or buy pre-made pancake mix (I like using this and I usually purchase it form Isetan Supermarket), and divide the batter into 7 portions and mix in some food colouring. The more food colouring = brighter/more pigmented pancakes. The baby woke up just as I was about done, so that was sort of good timing. She finally got to have her pancakes..but..she didn't want to eat them! The one day that I was open about her eating sugary, unhealthy stuff she didn't want to eat it..and not forgetting I took so long to make them. So oh well, I didn't force her and she had fun looking and admiring it so that was sort of good enough for me. 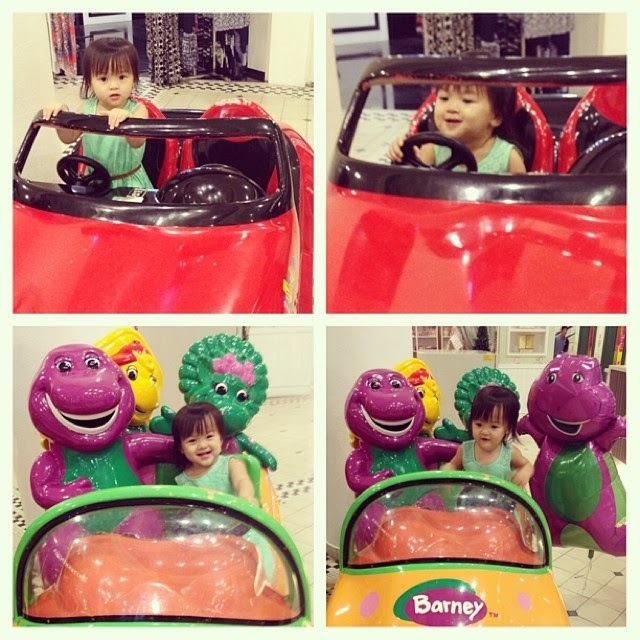 We took some of babygirl's monthly photos then headed out for some fun. For lunch, I brought her to Sushi Tei cos she loves chawanmushi and sushi rice. After that we got her birthday cake and headed home for her nap. By the time Kaitlin woke up, Daddy Li was home so we spent some family time together before going out for dinner. We decided a family place nearby would be best so Chilli's it was. Whilst waiting for our food to arrive, I quickly headed to one of the party shops to get a balloon for Kaitlin and let's just say..it was definitely worth it's price! 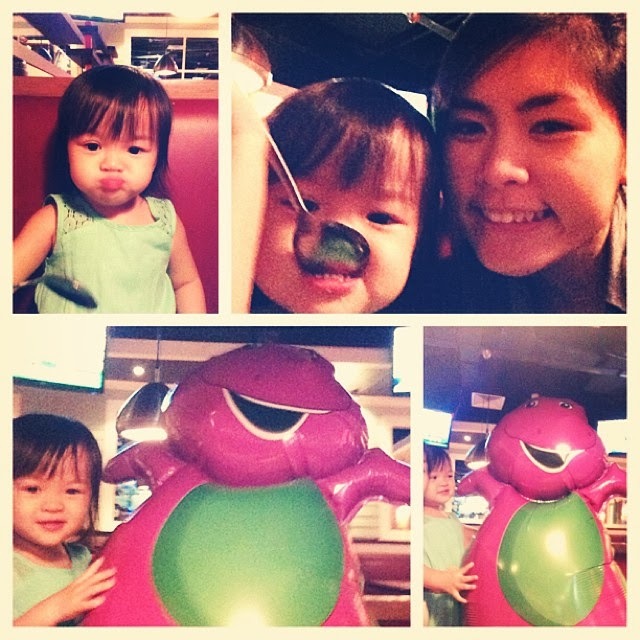 She was so happy about the Barney balloon and her expression when I surprised her with it was priceless! K and her Barney balloon got to have some fun at the kiddy rides after our dinner and needless to say she didn't want to leave. When we finally got home, it was time for Kaitlin to cut her birthday cake! She was pretty fascinated with the candles (I got the sparkling ones! )..and was looking at it almost the whole time. 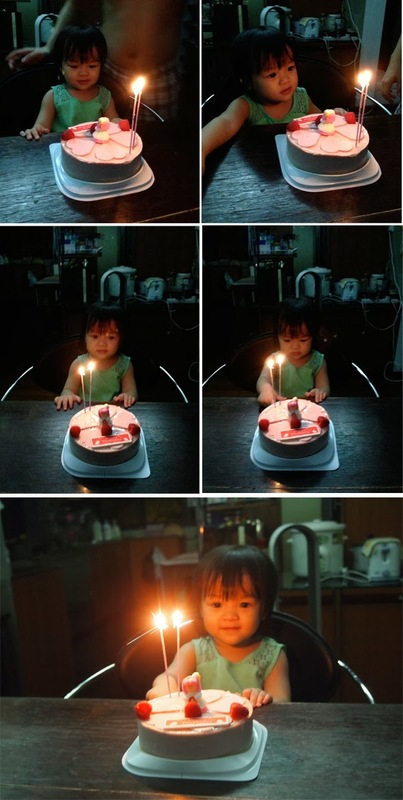 Unlike last year, she managed to blow the candles! Though for some strange reason, Kaitlin didn't want to eat the cake -.- Yes, all the cakes that we got for her this year, she didn't want to eat at all except for her birthday cake that we brought to school which she ate only one bite. 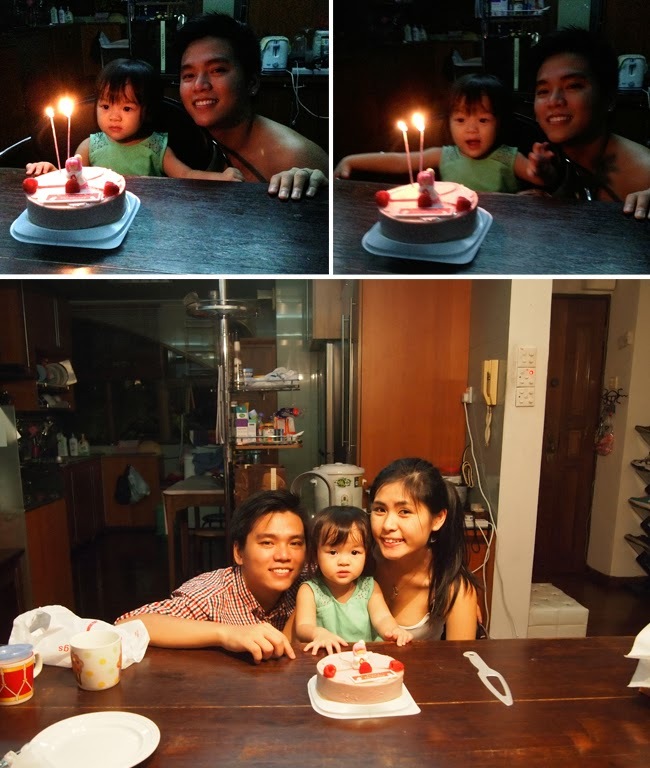 So well, we ended up finishing the cake for her. Hopefully by next year, she'll be into cake. Cos seriously, who says no to cake?! No fancy celebration, but Kaitlin was pretty much a happy little girl, and happy parents we were as well. Besides the fact that it was her birthday, I quietly celebrated with myself that we've been parents for two years! It's been a pretty amazing journey, and at times I wonder how we managed to get through all the colic issues, tantrums, her falling ill and us with lack of sleep etc. I'm thankful to be able to spend another year of her birthday with K..and the whole day as well! Got to have some private bonding time with her and it was just nice to be able to pamper her for the day. Idk how long more we'll be spending her birthdays with her before she decides that we aren't cool enough for her so I'm definitely going to treasure every birthday we spend with her!